Today’s bike club ride was a a bit of an oddity. We did a one-way ride to Santa Monica, just for the novelty of seeing the ocean and being able to take the Metro back to Pasadena. Our rides are usually about 40-45 miles, so a round trip to the beach is a bit beyond our usual range. But with the ability to make it a one-way trip, it’s easily within reach. The day started out overcast and a little misty. Pasadena gets like that a lot this time of year. But it usually dries up once we get away from the mountains. So we started out and headed south toward downtown Los Angeles. When we got to the bridge over the L.A. River, there were a lot of people there, all looking over the side of the bridge. That was odd, since that part of downtown is usually so deserted that there aren’t even any homeless people there. 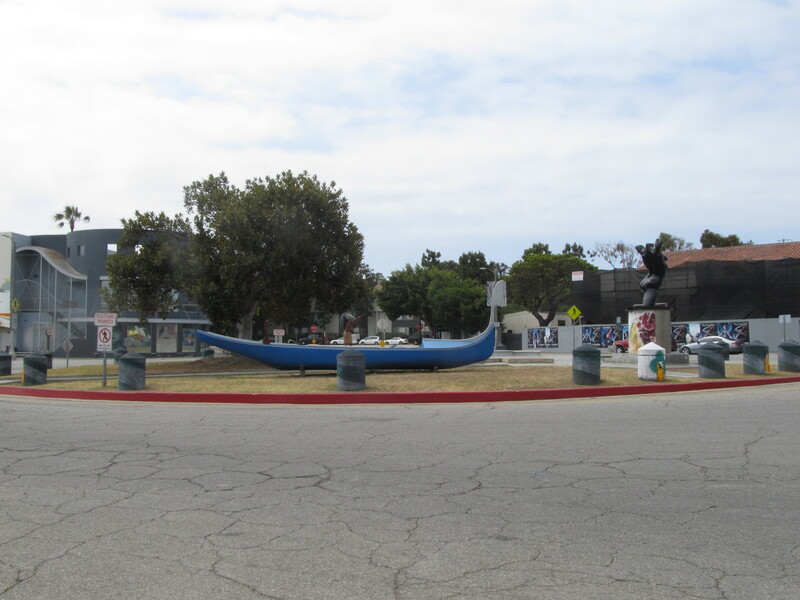 But we heard that it was the same group that made the Griffith Park tea house, and they were doing a pop-up art project in the river channel. We looked over the side, and we saw “AS IF NOTHING MAGICAL HAD HAPPENED” spelled out on the side of the channel in purple flower petals. 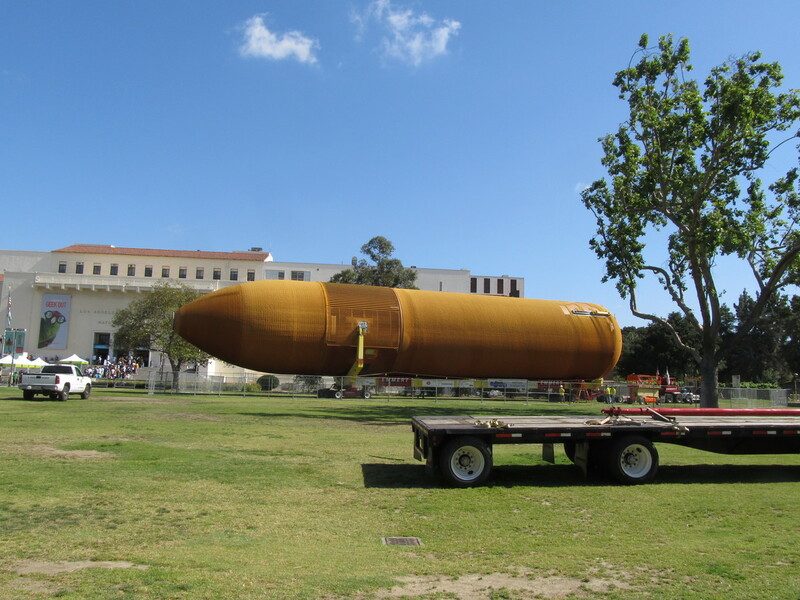 Jen and Amiee were along this week, but not last, so they missed seeing the Space Shuttle fuel tank in Exposition Park. So we took a short side trip into the park. But when we got there, the tank wasn’t sitting on the trailer in front of the Natural History Museum. Carla said that she’d heard that they moved it, but it’s so big there were a limited number of places it could have gone. I didn’t think they’d put it inside the building with the Space Shuttle, since the trees around the building didn’t look like they’d been disturbed. 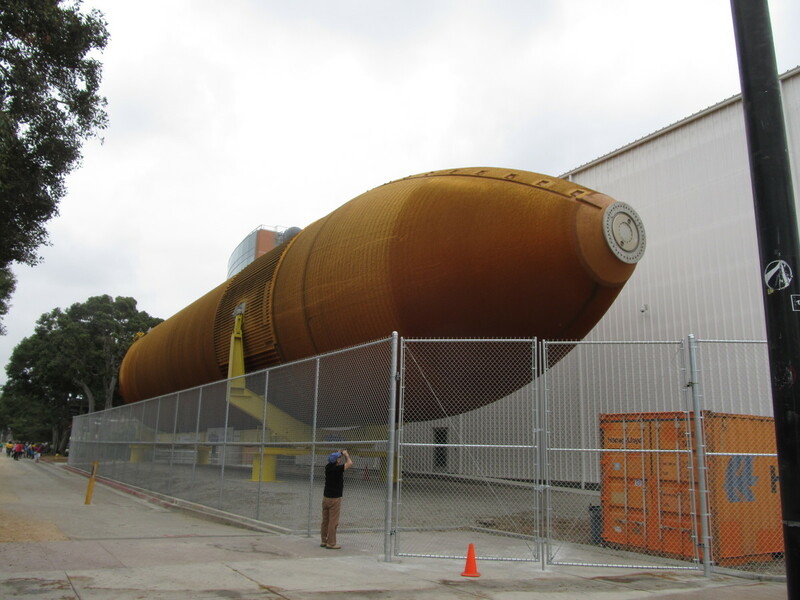 So I rode around the building, and the tank was inside a fence against the back side of the shuttle exhibit building. So we actually got a closer look at it this time. 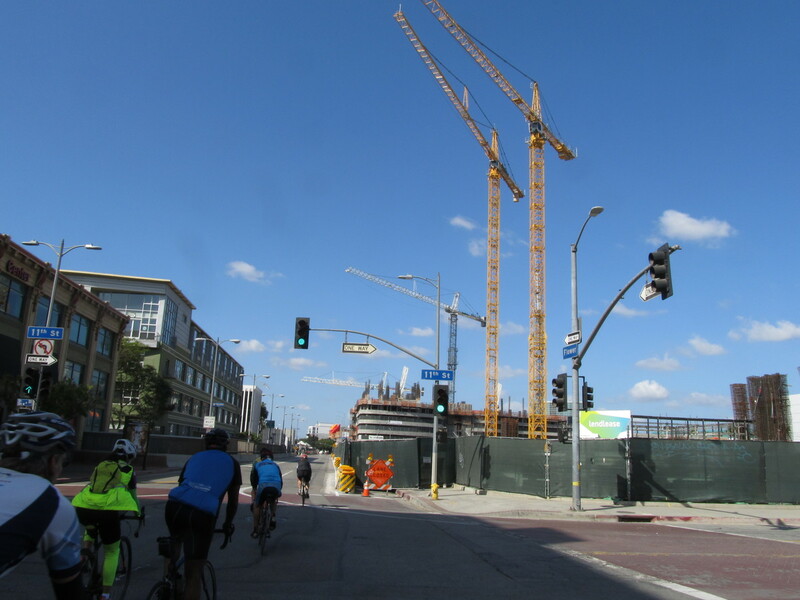 Continuing west, we rode the Expo Line bike lanes down Exposition and Jefferson, all the way to La Cienega. At that point, we picked up the beginning of the Ballona Creek bike path. I’d never been on the upper part of that before. 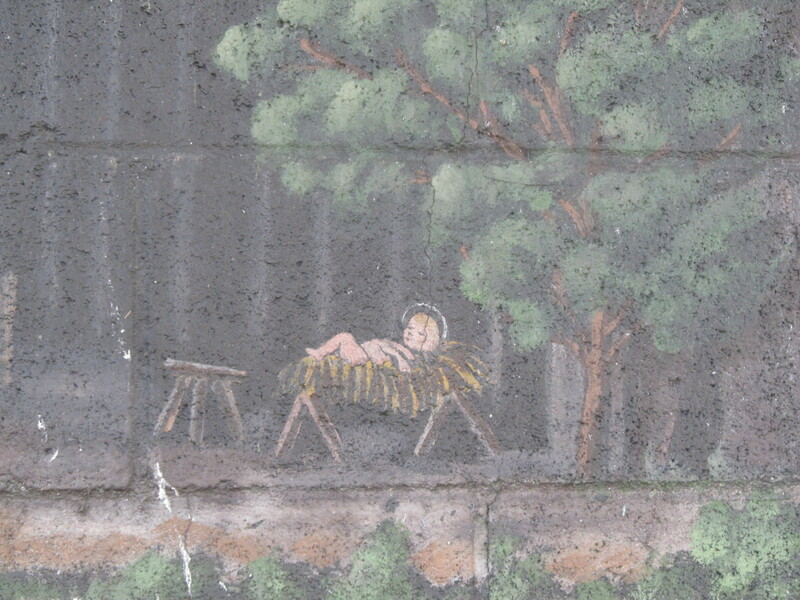 The pavement was kind of rough, but it was nice being off the street. 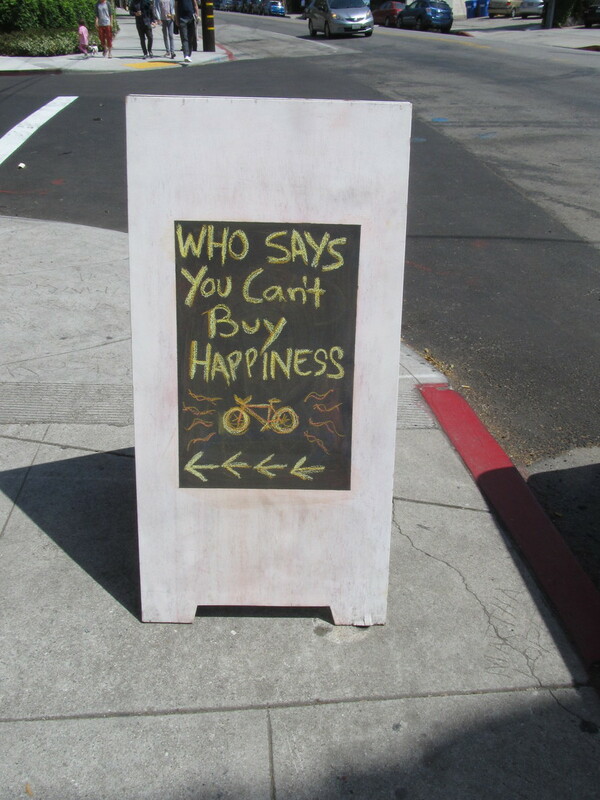 We rode that all the way to Marina Del Rey, where we turned north on the bike path there, and headed up into Venice. We took a short side trip to see the canals in Venice. 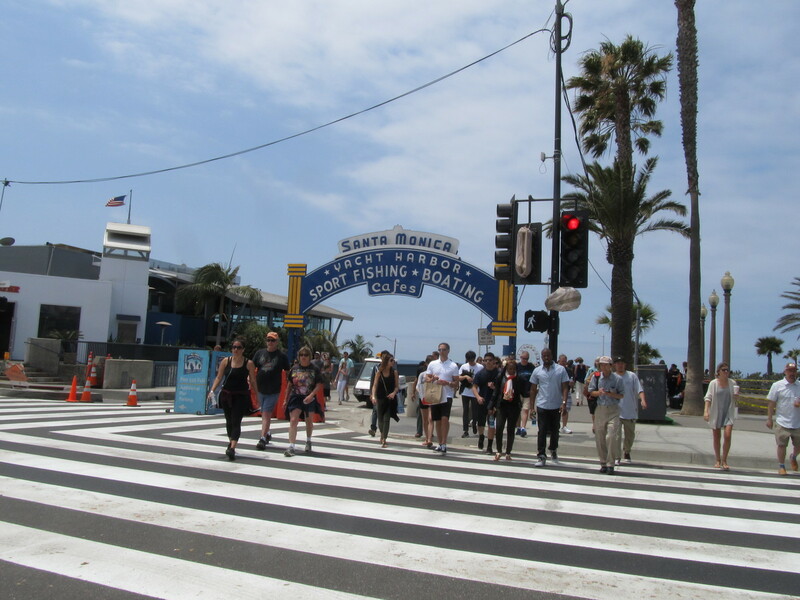 Then we headed up to Santa Monica. The plan was to meet up with my old friend Kathleen at Urth Caffe there. But when we got there, she was already there, but she was at the end of a long line out the door. 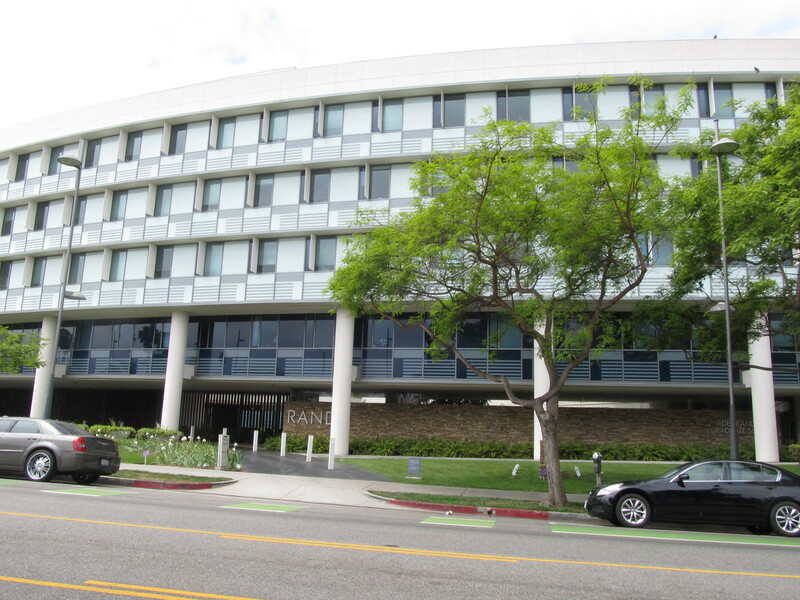 So we went to a backup plan, and we all went to the big Starbuck’s across from Santa Monica City Hall. 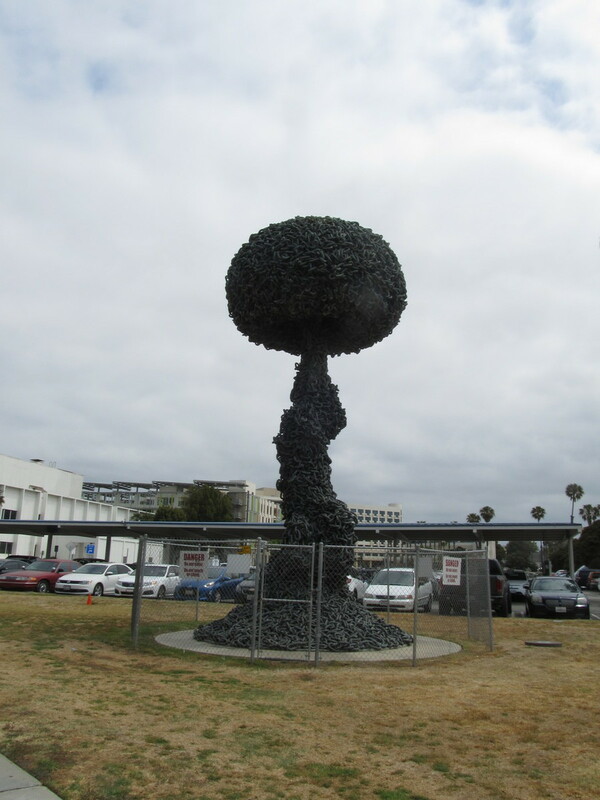 Along the way, we saw Conrad’s “Chain Reaction” sculpture, which I think is very appropriately displayed right across the street from the RAND Corporation building. We rarely stop at Starbuck’s, but today it was just the thing. We were able to get a table on the patio, and that was really all that mattered. We had drinks and snacks there for a bit, before doing the last part of the ride to the pier. 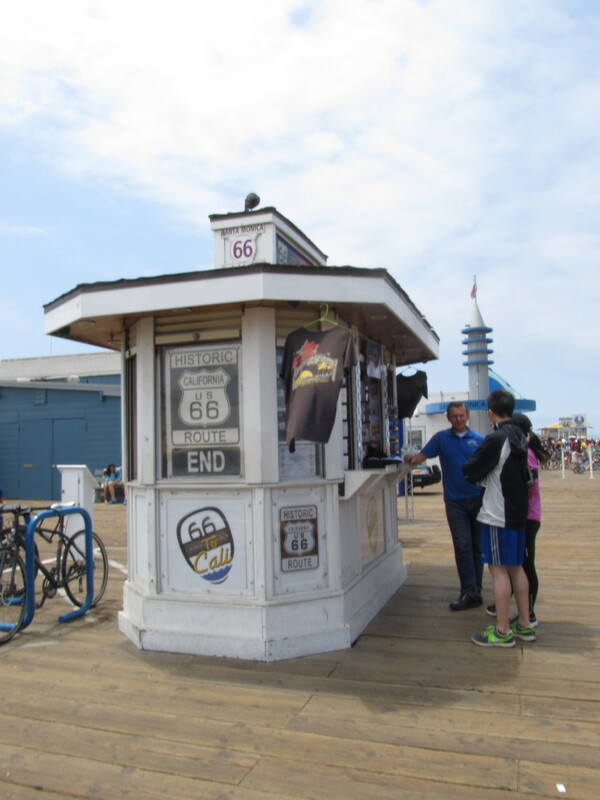 The pier was only a few blocks away, and we rode out on it to the little ‘End of Route 66′ kiosk and sign. 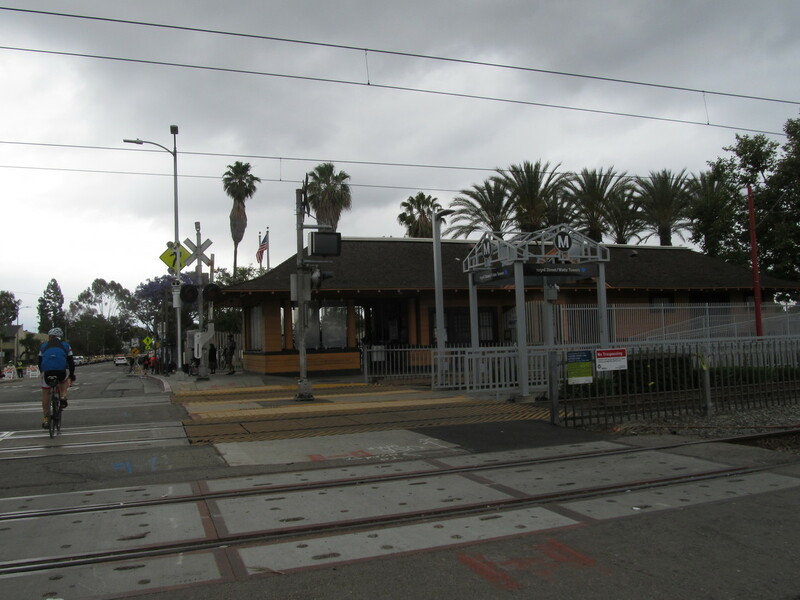 Then we headed the few blocks back up Colorado St to the Metro station, where we got on the train back to Los Angeles. We rode the train all the way back to Pasadena, and then the two miles from the Metro station back to the park where we’d started. 35 miles to Santa Monica. With the last two miles back to the park from the Metro station, we had 37 miles for the day, which is just about our normal Sunday ride distance. And it certainly was novel getting to ride to the beach. 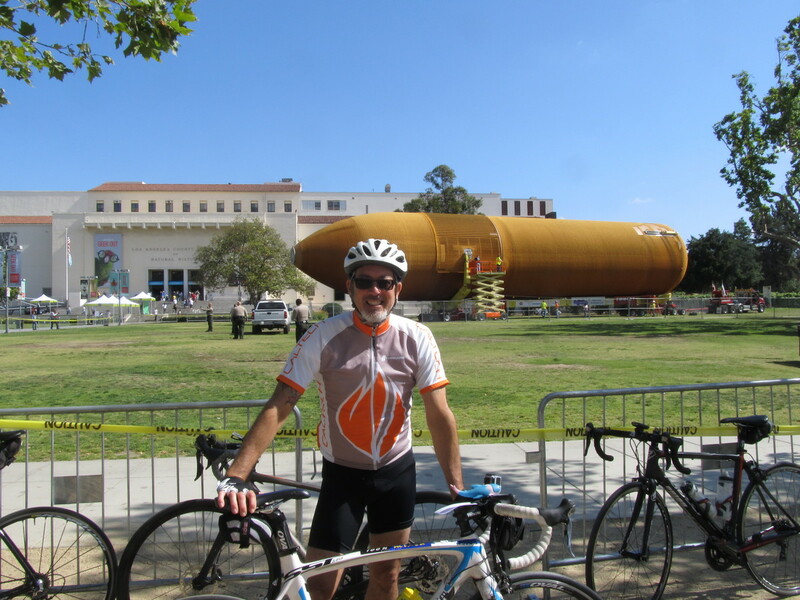 A few years ago, we rode down to near Exposition Park to watch the Space Shuttle Endeavour being moved to its new home at the California Science Center. 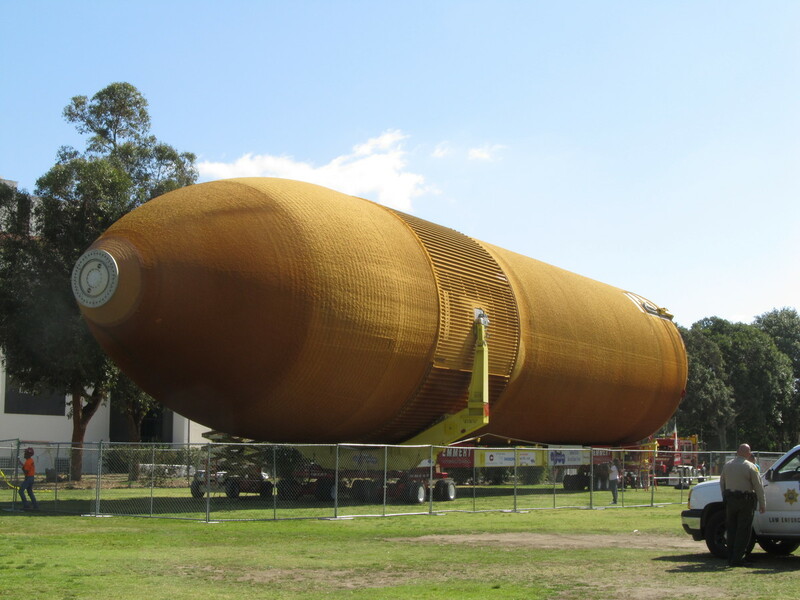 And today, we rode down to the park to see the last remaining external shuttle fuel tank, which was delivered to the park yesterday. It was cool and overcast in Pasadena when we started out, but it cleared and was pleasantly sunny as we headed south into Los Angeles. We rode through downtown L.A. all the way to Exposition Park. Leaving Exposition Park, we headed west on Exposition Blvd. 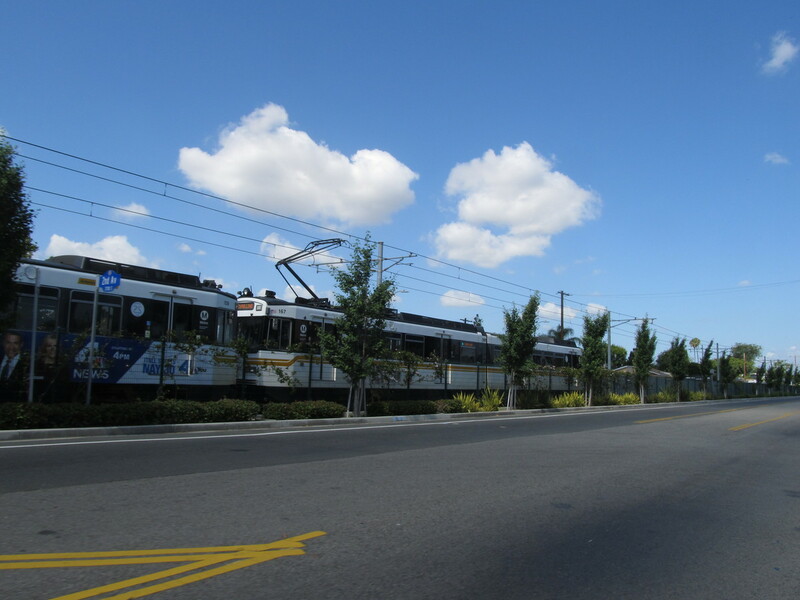 As part of the Expo Line, they built a bike lane along the street, so we rode that all the way out to Buckingham, just past Crenshaw. 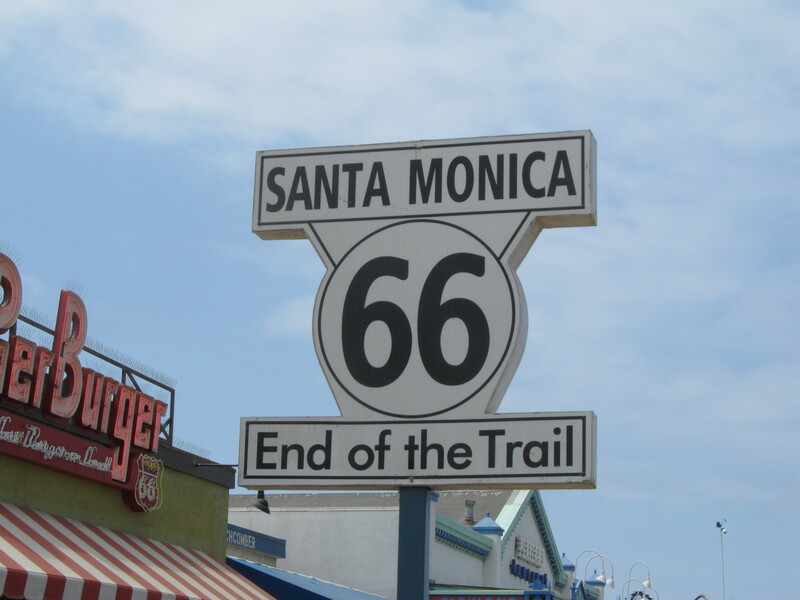 Along the way, we saw westbound trains with signs saying that they were headed for Santa Monica. 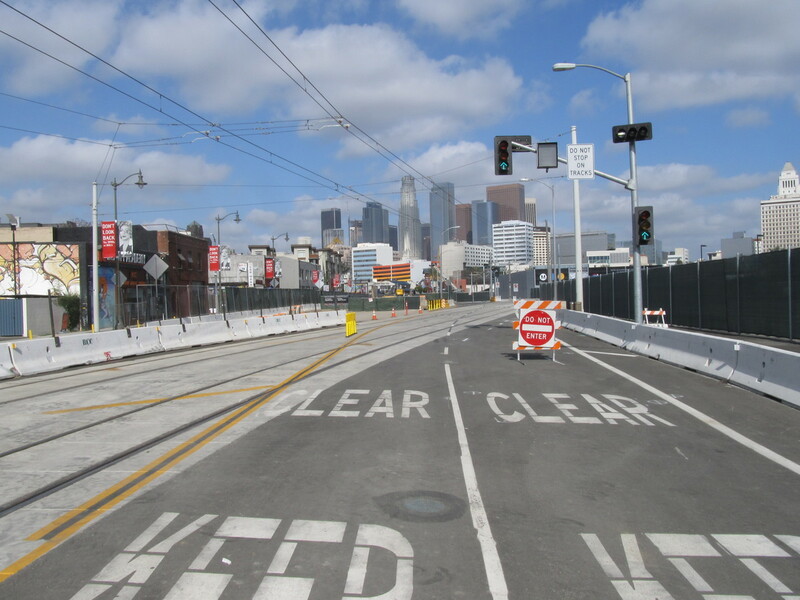 The new Expo Line extension from Culver City to Santa Monica just opened this weekend. Turning north, we rode up into Hancock Park and our snack stop at Noah’s in Larchmont Village. 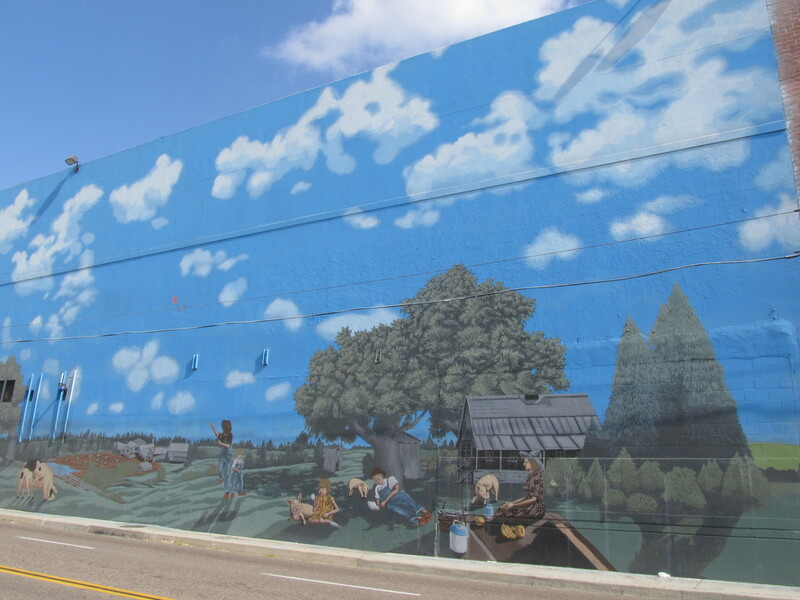 After that, we headed home by way of Benton Way across Silverlake, and back through Eagle Rock to Pasadena. 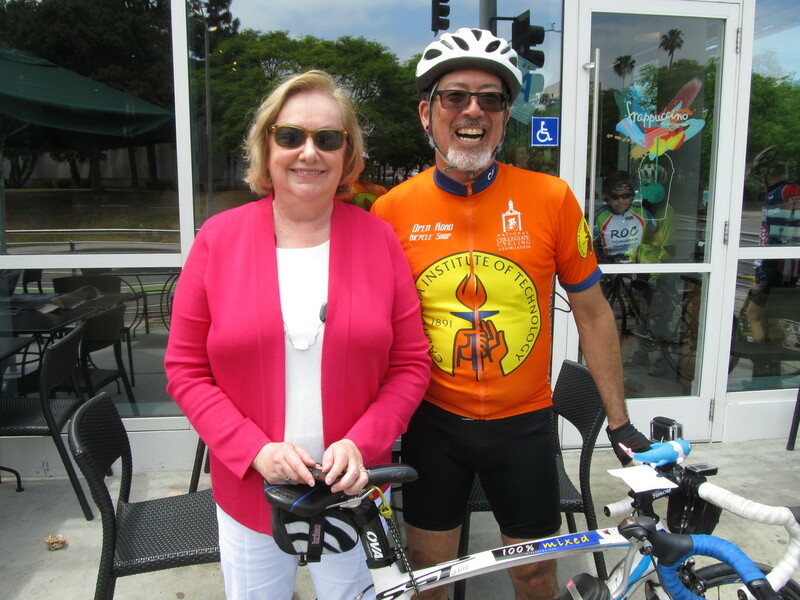 Today was the first Ciclavia – Southeast Cities event. This marks the first time they have put on an event like this in that area. 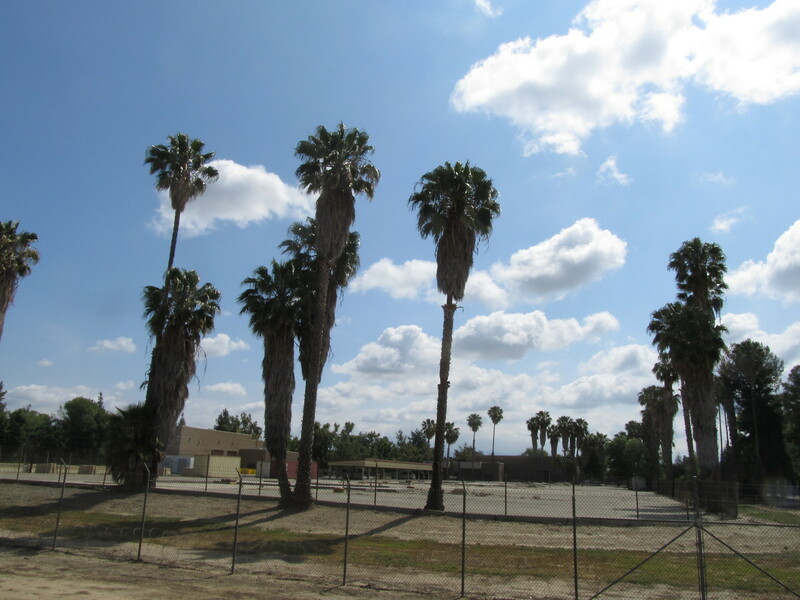 I had a look at the route, and I saw that one of the end points was right by the Watts Towers, so that was our destination for today. We’ve been to see the towers before, but this is the first time in several years. It was cool and overcast, with a hint of maybe-it-might-rain-but-probably-not. Because it was going to be a little bit longer ride than we usually do, I made the route as direct as possible. 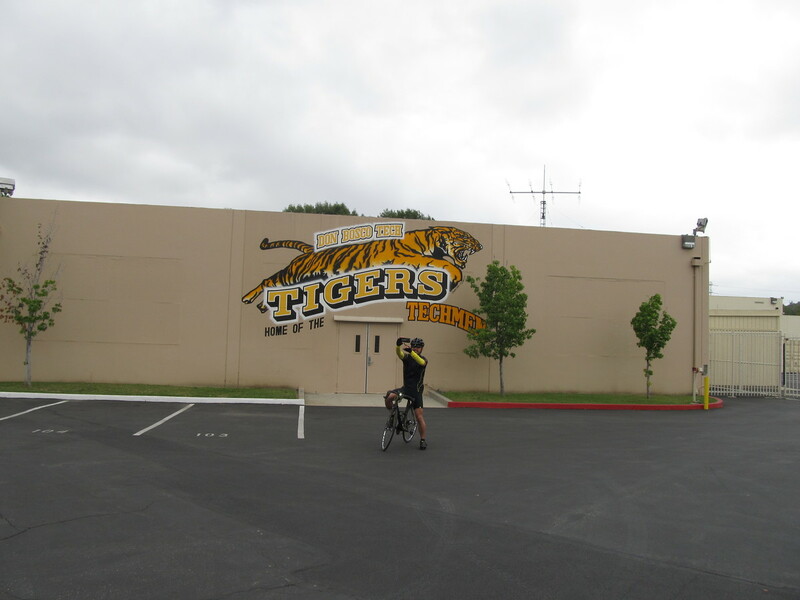 We headed directly south through San Gabriel, all the way to the Rio Hondo bike path. 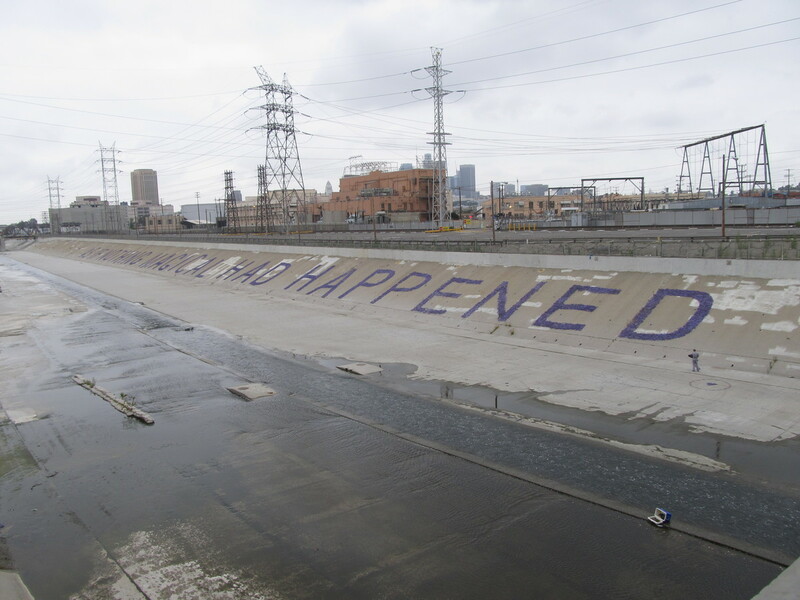 Then we rode that all the way to where it meets the Los Angeles River. There, we crossed over and got on the L.A. River bike path going north. 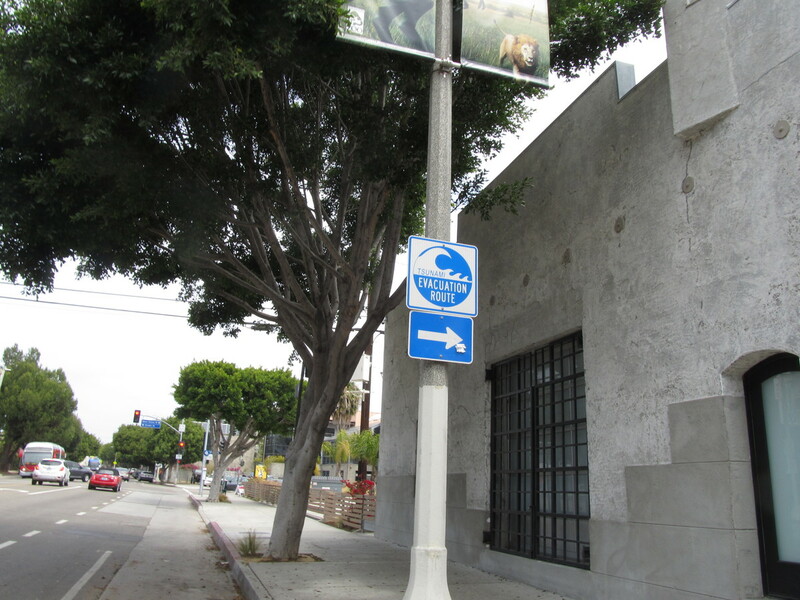 After a short distance, we came to where the Ciclavia route met up with the bike path. We got off there, and joined the party. Because this was the first such event held in the area, it seemed less crowded than other ones we’ve been to. There were still a lot of people, but it wasn’t the 405-at-rush-hour experience that the ride back from Venice was. 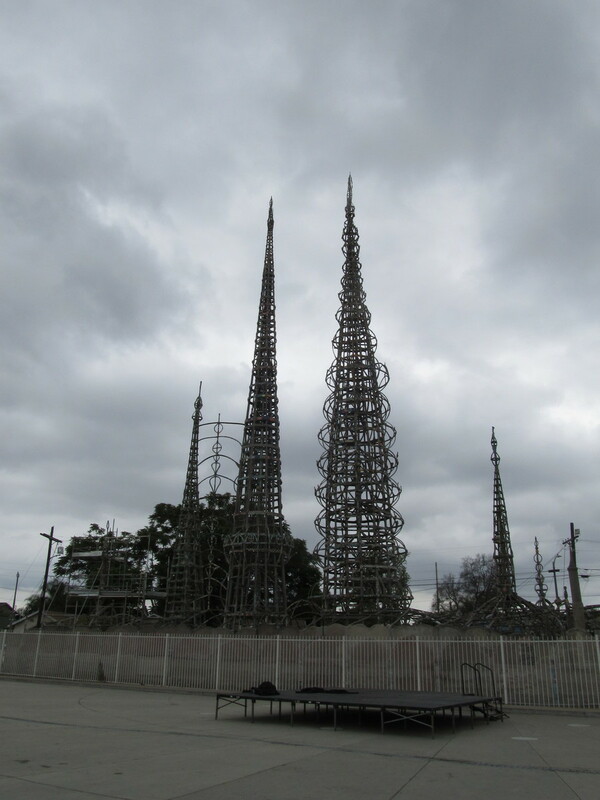 We rode the route all the way to the end at the Watts Towers, where we played tourist for a few minutes. At that point, we had a quick huddle and decided to just take the direct route back across Lynwood to get back to the bike path for the trip home. 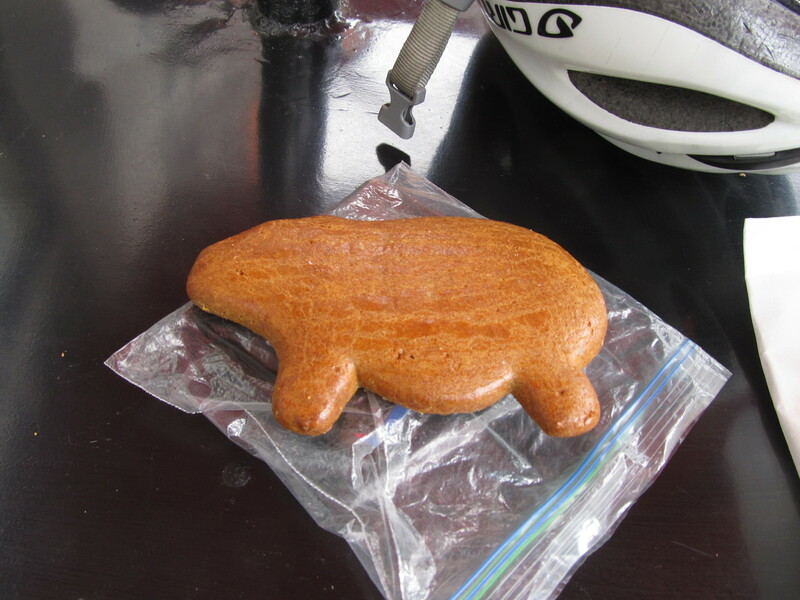 We stopped at a little Mexican bakery in Lynwood for snacks. Then we got back on the bike path and headed home. And we had a tailwind all the way home, which was a nice treat. A few weeks ago, I read an article about how the National Park Service is preserving sites used by the Manhattan Project during the development of the atomic bomb. Sadly, these are all too far away for us to ride to. But along the way, I found another article in a related vein. 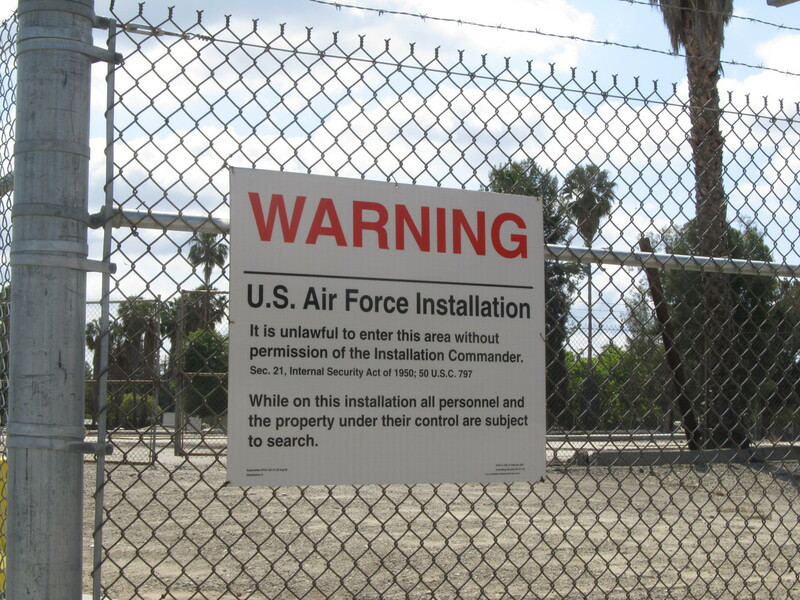 It was about how nuclear-armed missiles used to kept at sites in the middle of cities, including Los Angeles. Most of these sites are gone now, with the land being used for other purposes. 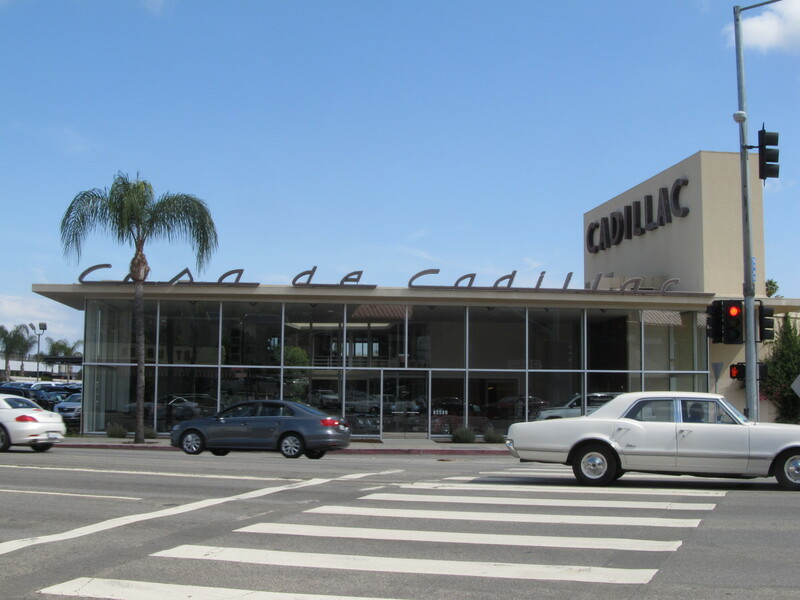 But the one in Van Nuys is basically intact, although the missiles were removed in the ’70s. So today’s ride was to go and see it. The Nike-Hercules system was built in the 1950s as defense against Russian bombers. One of the sites near San Francisco has been turned into a museum, which we visited a couple years ago. So even though we can’t go inside the site here, we know what it looks like. And it’s still odd to think they kept nuclear warheads right here in the city. 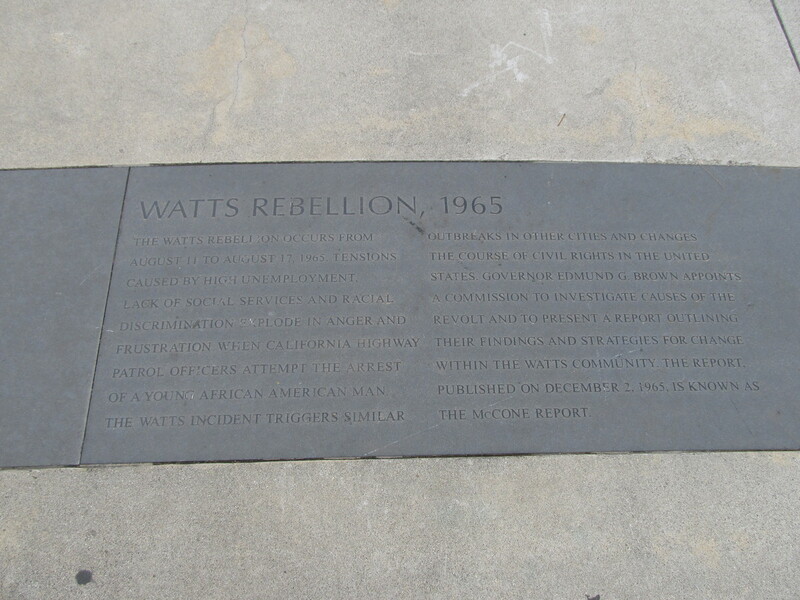 The site is right next to the Tillman Water Reclamation Plant, which we’ve visited before. We basically took the shortest route there and back, since Van Nuys is a bit farther than we usually roam. The Valley is pretty flat, so we made pretty good time. 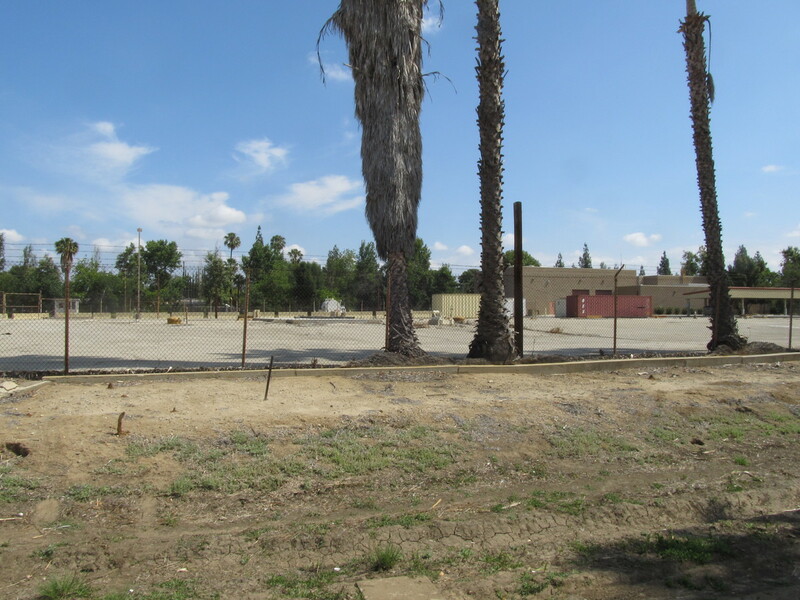 When we got there, we could see that the old launch site really is basically unchanged. The doors to the underground missile magazines are still there. But it’s all surrounded by a fence, so we couldn’t see it all that close up. Heading back, we took the Orange Line bike path back to North Hollywood and our snack stop at Panera. We rested there for a bit, and then headed back. We took the Chandler Bikeway across Burbank, and then straight across Glendale and Eagle Rock, up the Colorado hill, and back into Pasadena. It was a pleasant ride. Today’s bike club ride was a new one for us. 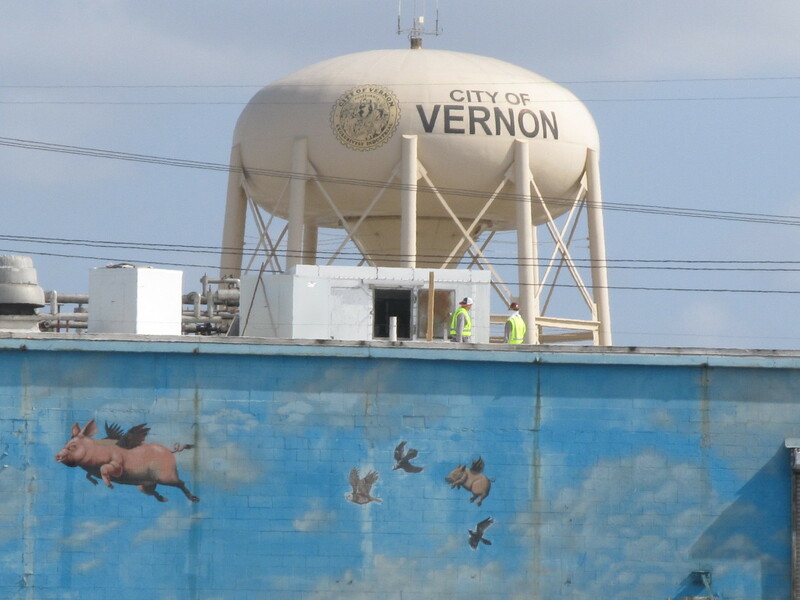 We rode down to Vernon to see the big hog murals painted on the walls of the Farmer John packing plant there. We took our basic route into downtown L.A., and then just took Santa Fe Ave all the way south to Vernon. Along the way, took a quick look to see how construction of the tunnel entrance for the Regional Connector. 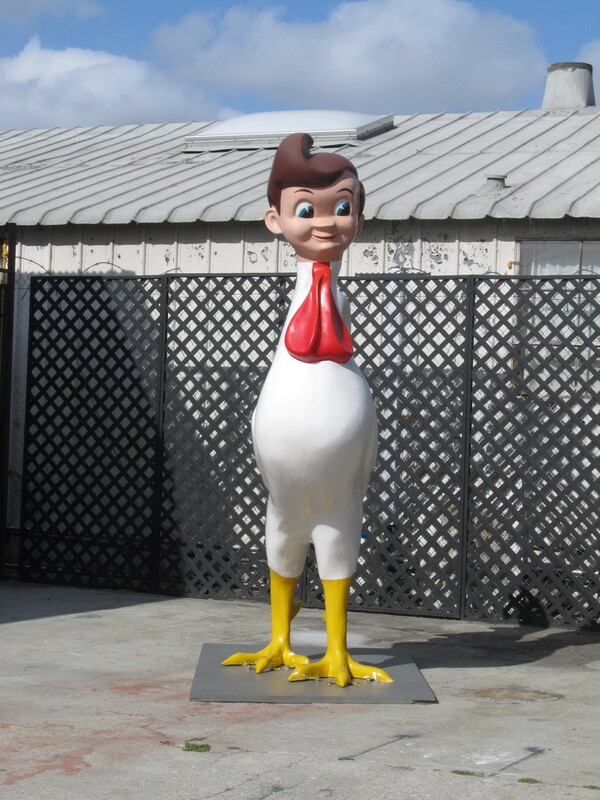 We also passed through the Arts District around the 6th St bridge, which was where we saw the chicken with the Big Boy head on it. That was kind of creepy and funny at the same time. 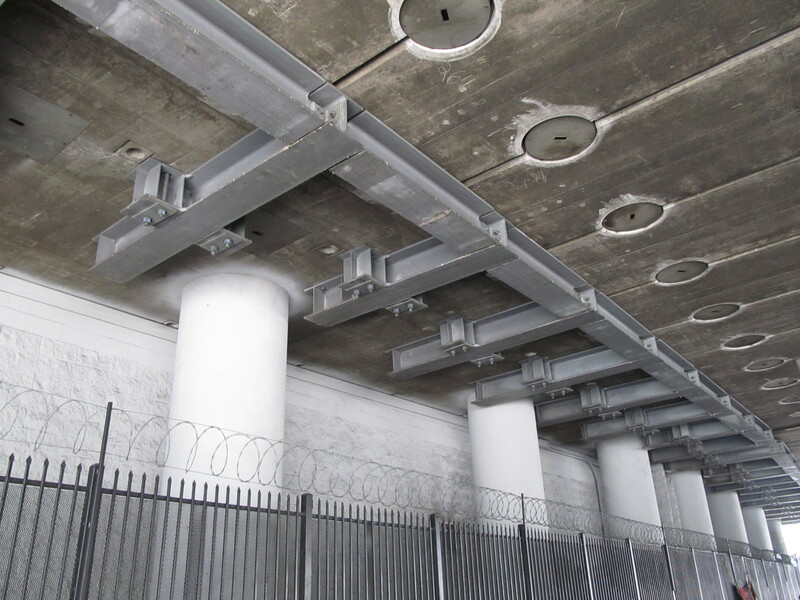 We passed under the freeway on the south end of downtown, and then rode over the bridge over the railroad tracks there, and then we were in Vernon. It’s an odd place, since basically nobody lives there. 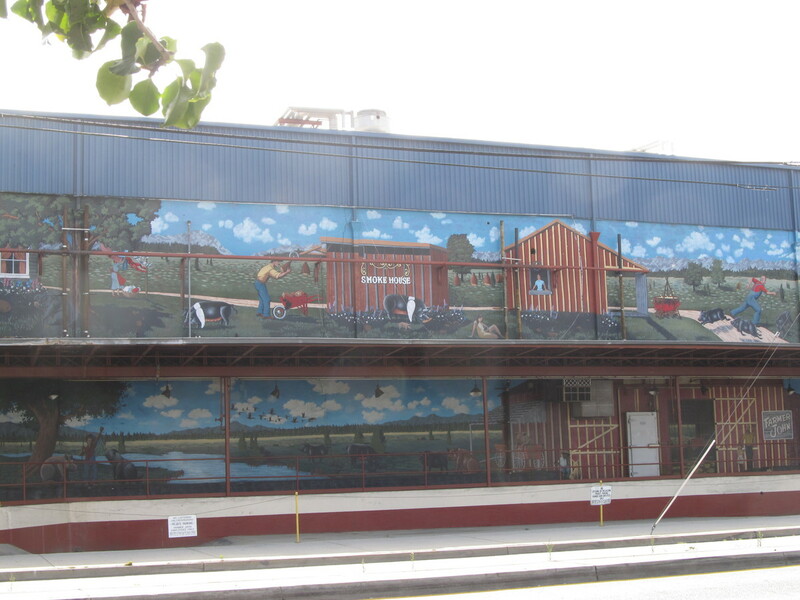 We rode for a while there to get to Vernon Ave, and then we were at the Farmer John plant. 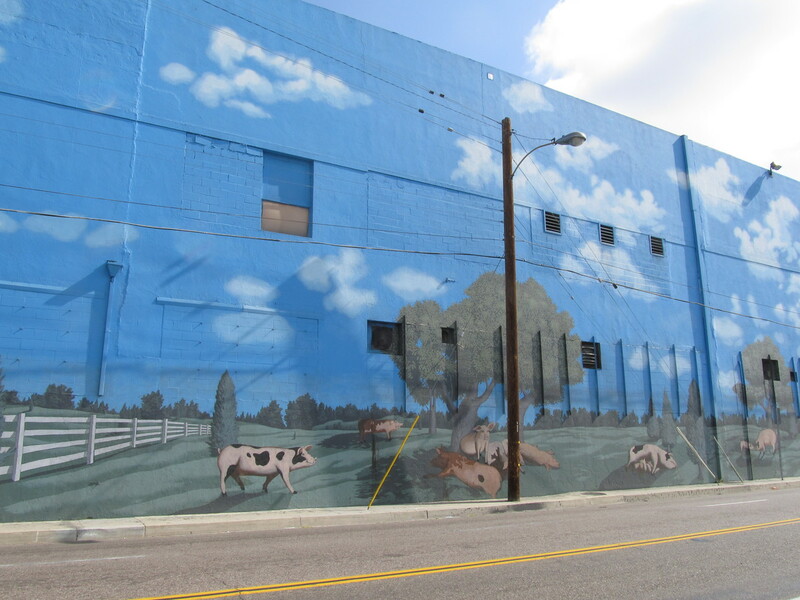 It’s a big building, and the murals wrap around two sides facing the street. 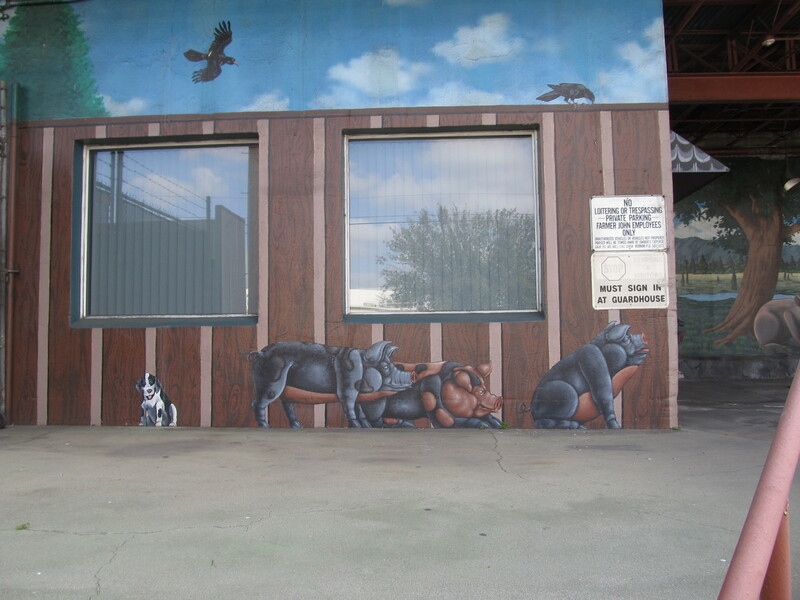 And then on the inside, just inside the gate, there’s the mural of the pig angels flying, presumably to Hog Heaven. The whole thing is very impressive in a weird way. Leaving Vernon, we headed west to come out at Adams and Grand, where we turned north, back into downtown. 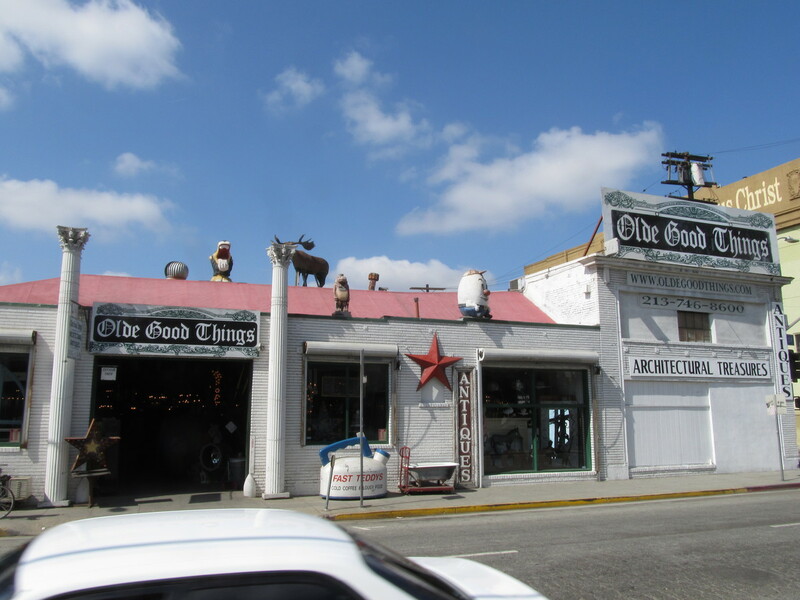 We passed by the big steel origami horse, and then we saw Olde Good Things, which is apparently a treasure trove of weird old stuff. We rode into downtown, all the way to 7th St, where we turned west. 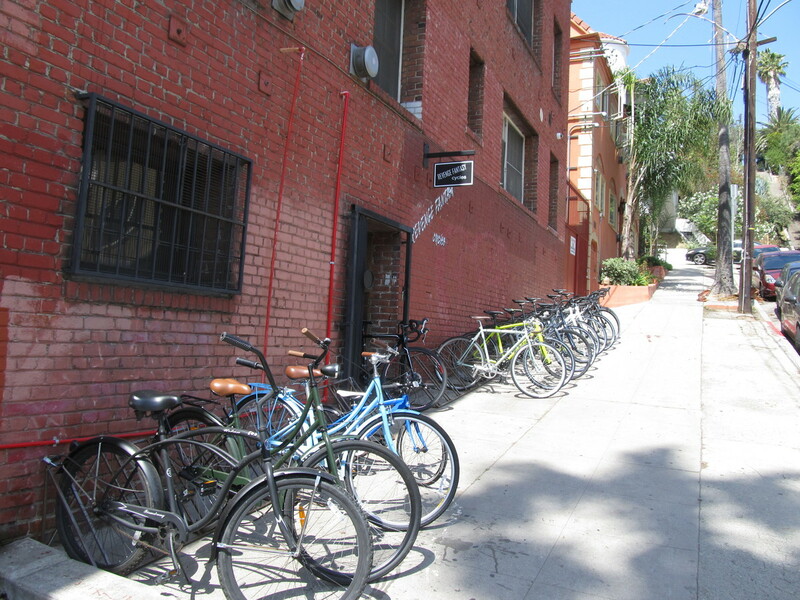 Then we took Bonnie Brae St up to Echo Park. 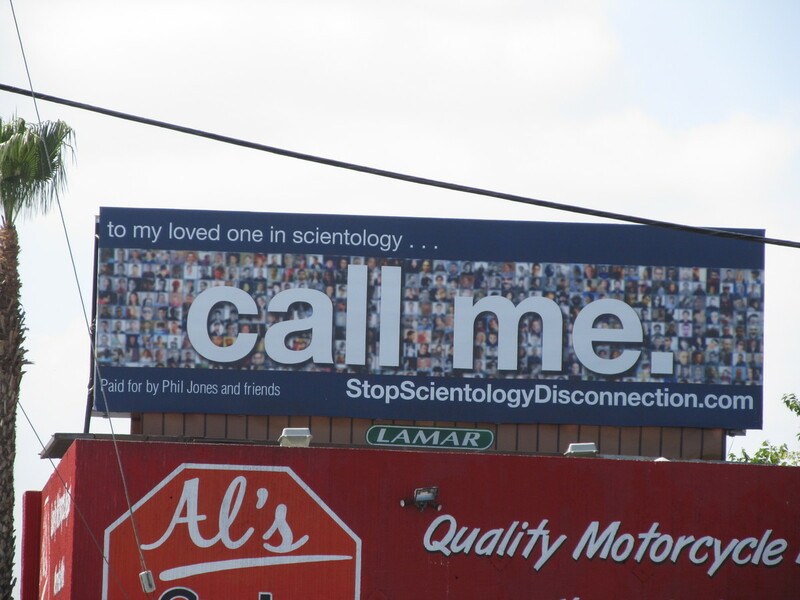 In Echo Park, we took a short side trip to see the new anti-Scientology billboard that recently went up on Glendale Blvd. Then we headed over to Chango Coffee. Our plan was to ride from there over to Chinatown, but it turned out that there was about to be a Dodgers game, and roads around the stadium were completely full. 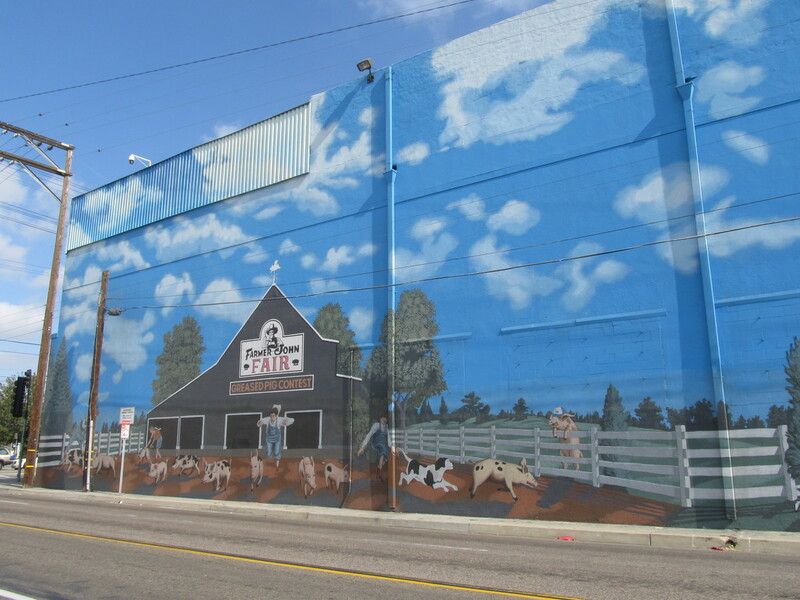 So instead, we headed out of Elysian Park and went up Figueroa St. Then we were able to get on the Arroyo Seco bike path right at the beginning of it, just off Ave 43. 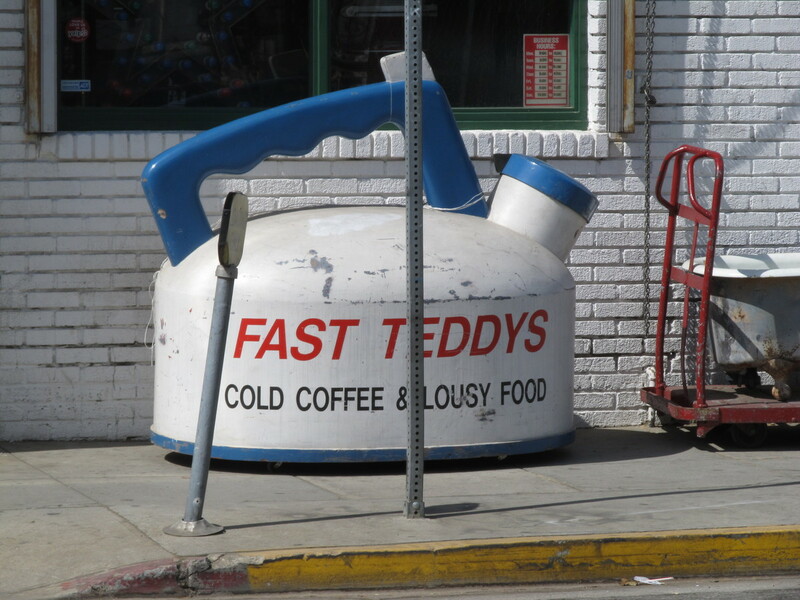 This brought us all the way back to South Pasadena. Then it was just a short hop to get home.